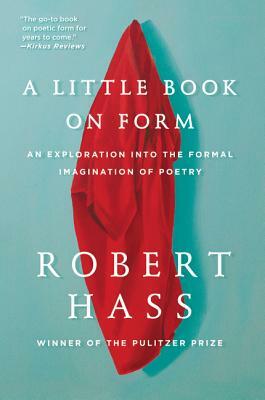 A Little Book on Form brilliantly synthesizes Hass’s formidable gifts as both a poet and essayist. In it he takes up the central tension between poetry as genre and the poetics of the imagination. A wealth of vocabulary exists with which to talk about poetry in traditional formal terms. But the more intuitive, creative parts of a poet’s work and processes are more elusive: if the most interesting aspect of form is the shaping power of the essential, expressive gestures inside it, how do we come to a language in which to speak about form as the search for the radiant shapes— the wholeness or brokenness—we experience inside powerful works of art? In suggestive, informal “notes,” Haas thinks through the idea of a poem from its barest building blocks—the one line haiku, the brief epigram or prayer—to the complex villanelle and sonnet, and beyond them, to the grand forms of elegy and ode through which poets across human cultures have investigated the shapes of grieving and desiring. His approach singularly employs postmodern perspectives on shape, thought, feeling, content, and movement, calling on Catullus and Allen Ginsberg, Kobayashi Issa and Czesław Miłosz. Begunb as a project for students of poetry, A Little Book on Form is anything but—Hass investigates the ancient roots of the poetic impulse, taking a wide-ranging look at the most intense experience of human thought and feeling in language. Robert Hass was born in San Francisco. His books of poetry include The Apple Trees at Olema (Ecco, 2010), Pulitzer Prize and National Book Award winner Time and Materials (Ecco, 2008), Sun Under Wood (Ecco, 1996), Human Wishes (1989), Praise (1979), and Field Guide (1973), which was selected by Stanley Kunitz for the Yale Younger Poets Series. Hass also co-translated several volumes of poetry with Nobel Laureate Czeslaw Milosz and authored or edited several other volumes of translation, including Nobel Laureate Tomas Tranströmer's Selected Poems (2012) and The Essential Haiku: Versions of Basho, Buson, and Issa (1994). His essay collection Twentieth Century Pleasures: Prose on Poetry (1984) received the National Book Critics Circle Award. Hass served as Poet Laureate of the United States from 1995 to 1997 and as Chancellor of the Academy of American Poets. He lives in California with his wife, poet Brenda Hillman, and teaches at the University of California, Berkeley.